The Art 2 Apartment in Barcelona is located in a 19th century building in the heart of the Gothic Quarter, next to the bustling Plaza Reial & Las Ramblas. This large apartment is beautifully designed and offers three comfortable bedrooms, one bathroom and a separate shower room, as well as all the necessary amenities needed to enjoy your stay here! Located in the same building as Art 1 and Art 3. -Parties in the apartment are strictly not allowed. -It is very important to respect the noise level (people, music) during the whole stay. We were met and welcomed by a very pleasant and helpful gentleman. The Apartment was clean and spacious. The two bathrooms were very handy. Our visit was in winter so we had no need to leave windows open for extended periods but we had double windows and doors which were all double glazed so the apartment was very quiet. The location of the apartment was brilliant. In the centre of the Gothic quarter and easy walking distance to many attractions. Washing machine and line was a bonus.- Habitat Apartments reply: Thank you for taking the time to share your review with us. It makes us happy to know that you have enjoyed it with us. Thank you! Excellent apartment in a lovely old building in the Gothic Quarter close to La Rambla. Host was there to meet us and in a good mood considering that Barcelona airport to 90 minutes to retrieve the plane's luggage. Excelente ubicación y apartamento amplio. Solo que deberían indicar desde un principio el número del departamento que te asignarán. The apartment Art 2 is located in Barri Gotic, Las Ramblas area. The apartment, on the corner of Vidre Street and Escudellers Street; It offers unbeatable access to the main attractions of Barcelona. Art 2 is located in the Barri Gotic, just 50 metres from Plaza Reial, an elegant palm-shaded square, and Las Ramblas, the thriving pedestrian boulevard at the heart of the old town. The area itself is a perplexing maze of narrow alleyways and enchanting squares which has changed very little over the centuries. Normally full of life, the Barri Gotic offers a huge selection of restaurants, bars and shops for all tastes and budgets. It is a very popular area with many tapas bars, restaurants, nightclubs and lot of life both day and night. It is a place for those who want to live Barcelona with a lot of energy. Metro stop - 340 m.
Metro stop - 366 m.
Plaza Real - 0.13 km. The Plaza Real is a beautiful square located just off Las Ramblas. It was constructed in honour of King Ferran VII who reigned during the contruction and features a lovely fountain in the middle. Gran Teatre del Liceu - 0.25 km. Gran Teatre del Liceu is Barcelona's opera house. Since its foundation in 1847, it fulfils its role as a cultural and art center. One of the most famous symbols of the city, Las Ramblas is the long walk from Plaza Catalunya to the sea, where you find the statue of Columbus. 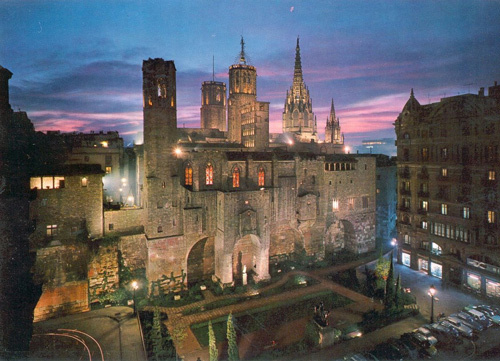 The Barri Gotic, its Catalan name (Gothic Quarter), is no doubt the true heart of the city. Its labyrinth of winding streets and asymmetric squares goes from the famous Las Ramblas to the sea at ‘Drassanes’. While enjoying the gothic architecture your senses will be stimulated by the smells of different types of food, beer and sites of street artists, all making this area unforgettable. First the warm water does not run, but with the help of the representative all got in order a little bit later. The apartment is lightfull and has enough space for all. The equipment is good. The location of the apartment is wonderful, but it would be nice, if the entrance of the building and the staircases will get a renovation. Un departamento muy bien situado. Cerca de las Ramblas y de la Plaza Real. Tiene todas las comodidades eramos 3 adultos y 2 niños! amplio y con bonita decoración. Muy satisfechos de nuestra estancia. Apartment was in a great location, just off Placa Reial, 2 min walk from La Ramblas / 5 mins from Mirador de Colom. Although Placa Reial is a busy square, day & night, the double glazing was great & we could hardly hear any outside noise. The apartment was clean when we arrived & had everything we needed for a short stay (4 nights). Barcelona is a great city & we have much more to see, so will be back. If we return en famille, would happily rent the same flat again (3 bedrooms / 2 bathrooms). We thoroughly enjoyed our stay in Barcelona. We were slightly disappointed with the apartment considering the money we had spent. We felt it looked a bit 'tired' and needed a lick of paint. It was however clean, tidy and comfortable just requires some TLC! Lovely apartment. Excellent location right next to Plaza Reial, off La Rambla.Excellent value. would def use again. Nice appartment situated in the hart of the city! There were 3 couples in our group for a weekend break. Apartment had 3 spacious doubles and 2 bathrooms. It was very quiet with the shutters closed even though the street was busy with people wandering around gothic quarter. Kitchen was well equipped. Very close to La Rambles. Plaza was at end of our street with lots of restaurants and bars. Great location. Lovely apartment in a great location. Appartement parfait, propre, super emplacement. Personnel d'Habitat Apartments hyper efficace. Je recommande cette location sans aucune hésitation. Apartment lovely. Very central and has everything you need plus a few extras. Beds comfy. Quite noisy at weekend. Service by habitat excellent. Very friendly. Would stay here again. Perfect apartment perfect location. Shower in small bathroom had to be held to use but still fine. Lady who met us had to come and find us as we were lost but she was lovely about it. Would Definatly use again / Habitat comments: thank you for your e-mail, we will take a look at the showerholder! Apartment 2 was fantastic in terms of location, cleanliness and the service provided by Habitat Apartments. This is the 2nd time we've booked this apartment and we would definitely recommend to friends and family. Alexandra who checked us in was very friendly, professional and helpful. It was a very nice welcome at 1am when we finally arrived! Thank you again. This well appointed apartment with an unbeatable position will please a family or 3 couples. Easy access to Metro and Bus Turista makes this apartment user friendly. Being in Barri Gotic made the apartment more interesting as you embraced the modernistic buildings and the Roman ruins. Big fresh food market in walking distance on Les Ramblas. The apartment was adequate for 3 couples and had everything we needed. We loved the location as it was within walking distance to almost everything we wanted to do. Pro: Location, Price, WiFi, Washing machine+dryer. Con: Location (since it's centrally located, it gets loud at night, like store closing, people shouting...etc), Cheap and dirty, stained furnitures. I never once sat on living room couch which converts to bed. Under the beds were filthy, found a broken perfume bottle. Coffee machine & mocha maker are too dirty to use. Elevator is filthy, smells of urine. Door handle broke, repair guy showed up 2 days later at 10:30pm and couldn't fix it. Response Habitat Apartments: Thank you for your comments. We are pleased you liked the central location. The highlighted issues have been reviewed, thank you. The apartment was everything we needed for our stay in Barcelona. It was safe, quiet and in the middle of everything the Gothic Quarter has to offer. We loved this apartment, perfect location, everything you need in the apartment is there - apart from a full length mirror at least in one of the bedrooms. An excellent apartment with an even better location.Just a minute walk from Las Ramblas, and located in the middle of a bustling neighbourhood.The apartment itself was spacious, clean and very comforting.The only negative thing I'd have to say was that the lift was out of order during our stay, which wasn't easy as we were on the 4th floor with a baby, so had to take he pushchair up and down the stairs - considering the company knew we had a baby, we would expected to be told before we arrived // Julia from Habitat Apartments: Many thanks for your review and a big sorry for the inconveniences. The lift is fixed now. Excellent experience. Can't fault anything. Donny was on time & very professional. Great flat great location only slight problem was the toilet in the shower room which was not cemented to the floor and the walk in shower the head would not stay attached to the holder making it a hand held which my 81 year old mother found difficult. If it had the same set up as the shower head over the bath this would have made the stay perfect. Very good location. Correct and good service. Pitty the small balcony was occupied by the airco unit. The two badrooms are small and too basic.We had a nice stay over. This apartment is great! Good location, clean, spacious, big beds! Just perfect for a city break and really nice have 2 bathrooms! We really enjoyed our stay here. Definitely recommended. Mooi gerenoveerd appartement op een mooie locatie, midden in het centrum. Aardige ontvangst op de afgesproken tijd. Wel ramen dicht 's nachts ivm geluid buiten. Great location apartment really clean. Mattress very hard in all rooms but other than that great. It is the 2nd time I have stayed in Art 2 and it really was showing a bit of ware. Time and clientele do this. Apart from this, there are no complaints. (Habitat Apartments Team - thank you for your comments! The apartment has been refreshed). Overall, very good. Very positive experience. Excellent location - right in the middle of everything ! Apartment was clean and beds were comfortable. excellent stay. Great apartment, great location. Overall would recommend and would stay again! A BIG thank you to habitat apartments for a amazing stay in Barcelona. From the advice before booking to the fabulous apartment, you could not fault the service habitat apartments provide. As there was five in our party, habitat apartments referred us to Car Deluxe for transportation to and from the airport. This was a very useful and highly recommended service. The apartment itself (Art 2) was modern, clean and well maintained. It is in an excellent location on the Gotic Quarter (just off Las Ramblas)Another useful service that habitat apartments provide is the food welcome pack. I emailed them the week before our stay with a list of food and drinks and they bought it for us (for a slight service charge) so it was ready when we arrived. It was perfect as we only arrived at 7pm at night so saved time looking for a supermarket. If you do need a supermarket, there is one around the corner which is ideal. I would highly recommend habitat apartments to anyone. Enjoy! Overall excellent. The location of the apartment is great and the interior is also very nice. Good value for money! Everything was ok, thank you! Overall very good. A big thank you for the habitat crew. We really enjoyed our stay in Barcelona a big thank you! Appartement au coeur de la ville, coté ramblas. Trés calme (insonnorisé), 3 grandes chambre et très bien équipé. We've had a lovely stay in your apartment and you've been very kind! Thank you! excellent - could not fault the service from the time I booked with you to the time I left - first class apartment, first class service. We found the apartment well centrally located. The apartment itself was very good; plenty of space and nicely decorated. It gives you exceptional value for money. Everything was covered by Habitat, right down to where the supermarket is. We would definitely recommend this apartment. A great apartment from which to explore Barcelona. Very comfortable beds - and the quietest place we have ever stayed in Barcelona! A few mirrors close to sockets in each bedroom would be useful for drying hair and make up etc. We had a lovely time in the apartment - ideal location and well equiped. Firstly thank you for all your services and chocolates! The only suggestions we would make was the apartment could require a paint and the hot water was inconsistent which resulted in shower issues. I would defintely revert back and recommend you're company. Thanks again and hopefully will be back to you in the new year. Kind regards, Mary and friends. (Habitat Apartments: the apartment has been refreshed & boiler now works fine - thank you!). The apartment was great. We didn't use the extra Habitat Service that much, so that's why we only rate it as 5, and we were generally satisfied with our stay. Hi, we completed the questionnaire left by the lady who met us at our apartment on the day of arrival. This lady was extremely helpful and friendly. We loved the apartment and would definately stay there again if we return to Barcelona. It was of a high standard, well equiped and good value for money. I would definately recommend it to anyone I know visiting your wonderful city. Many thanks for a fantastic stay. Thanks, we had a great time in Barcelona. We completed the feedback form and left it in the apartment. We thought the apartment was in a very convenient location and it was clean and comfortable. Thank you for your service. It was a great stay!!!! The location is spectacular and the apartment is very nice and clean. The only suggestion is to add air conditioning in all rooms. In general was excellent!!! This 3 bedroom apartment in Barcelona is located in a 19th century building in the Barcelona's gothic quarter.